I’m a huge fan of TV cookery shows and, as a bit of foodie, I love to cook most days. 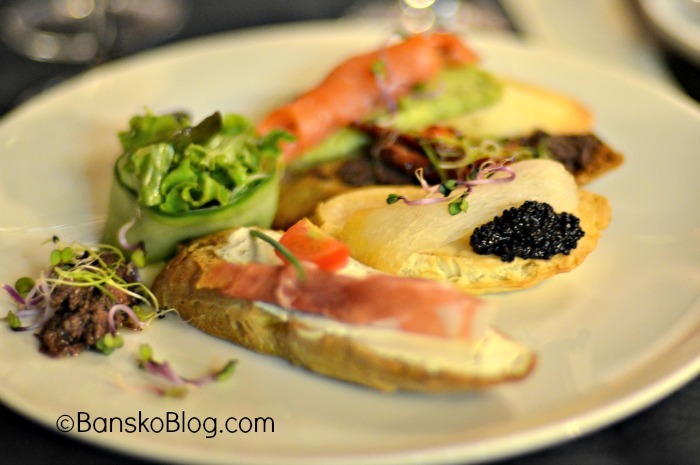 So it is always with considerable pleasure for me to blog about food in Bansko. This time, I was especially excited to be invited on the media opening day of the Gastronomy Festival. This was located at the Premier Luxury Mountain Resort in Bansko. You could have been forgiven for thinking that Heston Blumenthal (Three Michelin starred chef) was with us. The chemistry set had arrived, in the guise of a liquid nitrogen tank. The demo session saw the nitrogen “smoke” rise high and then serenely flow over and around the large stainless steel mixing bowl. Ice cream in an instant. I can reveal it all seemed easy to do. Just grab a large stainless mixing bowl. Make your ice cream mix with eggs, milk, cream and sugar. 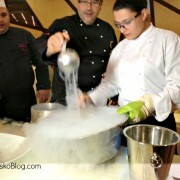 Then gradually add the liquid nitrogen, whilst stirring the mixture. This freezes the liquid. The result is ice cream. The liquid nitrogen tank also came out for the making of bite sized foam treats. A mouthful full of flavour that causes dry ice to pour from the mouth and lips. Plenty of laughter. 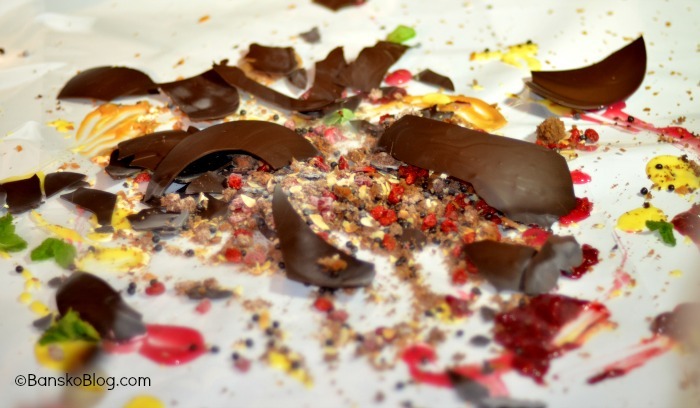 The nitrogen canister was wheeled out for a a second time — the chocolate egg surprise. The grand finale to the gourmet dinner. 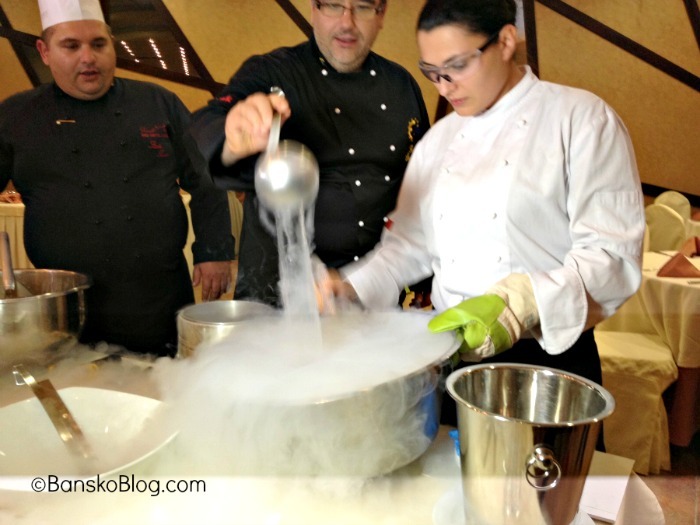 The guest chefs were from top rated Bulgarian restaurants, such as Ivailo Petkov from Lazy, located by the gondola lift in Sofia and Lord of the Chefs TV show winner, Sidoniya Radeva owner of the Sidoniya restaurant in Sofia. Cookery books and recipes are one thing, seeing professionals prepare food is another. I got a ton of tips and ideas from watching them prepare dishes. It is worth noting that they all spoke perfect English, are approachable and care passionately about their craft. My overall impression in that these top chefs are helping to propel the often variable Bulgarian restaurant scene to new gastronomic levels. 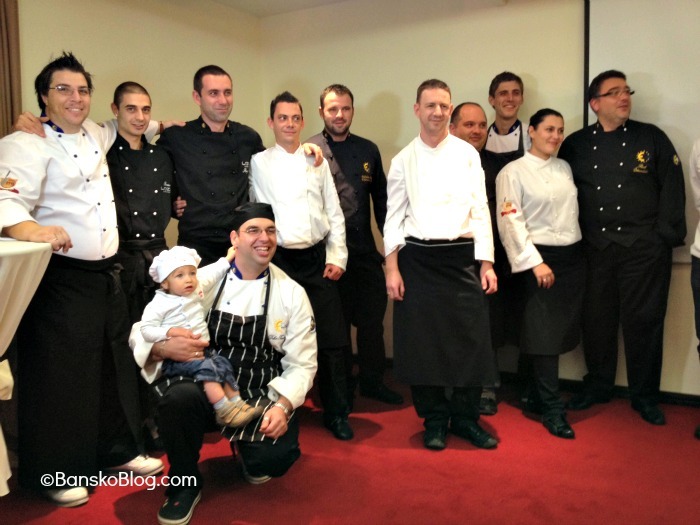 I’m certain that their influence on the Premier’s Gastronomy festival in Bansko is another step to put Bansko on the foodie map. 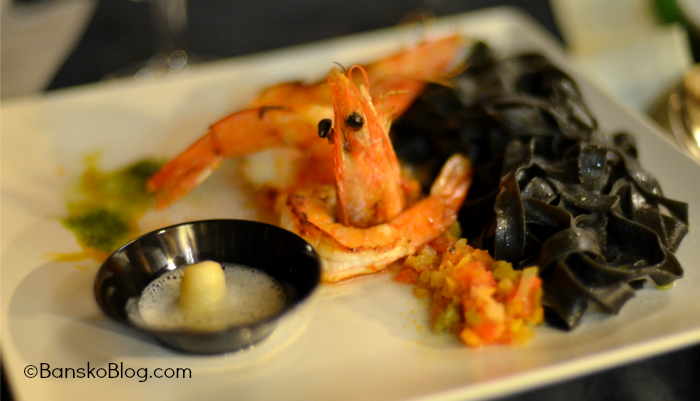 Ultimately, it is the food and service that impresses me and, from what I tasted, the Amvrosia restaurant at the Premier Luxury Mountain Resort will make it into my Top 10 Bansko restaurants. 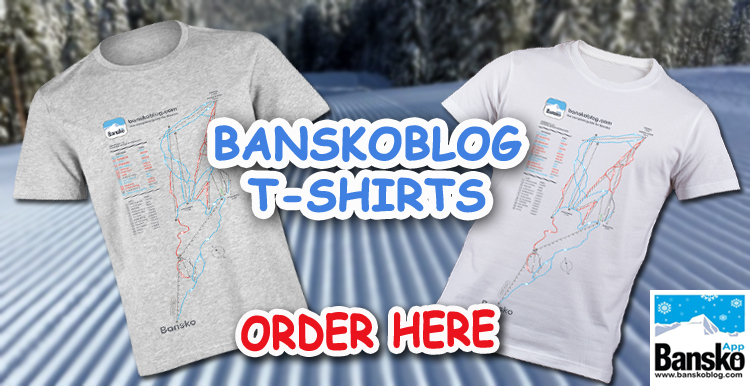 These are listed in “The Essential Guide to Bansko” which is sent out for free, along with updates to all Bansko Blog subscribers. 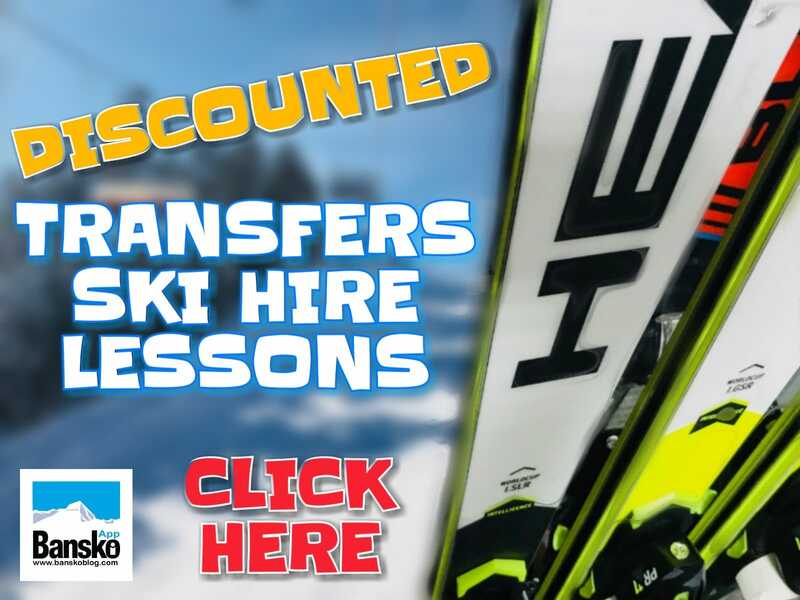 If you’re in Bansko sorting out your apartment — or just taking a break before the festive season, then why not come along to the Premier? There is something for all the family. Cooking demos, children’s baking, gourmet dinners, wine tasting and shows. We were given a tour of the hotel. The Victoria Spa with swimming pool and the many treatments comes recommended. The Nectar bar with its designer centre piece fire place is also worth the trip. The hotel suites have some stylish Philippe Starck influenced designer touches. Sleek bathrooms and plenty of wood and luxury fabric set the tone. I met the Greek family owners, as well as Konstantina Papounidou, the General Manager. I was immediately struck by their energy, positive attitude and creativity to promoting their Bansko hotel business. Having been involved in putting on events myself I know the huge effort that they put into making the Gastronomy festival happen. They expect this to be the first of an annual event. 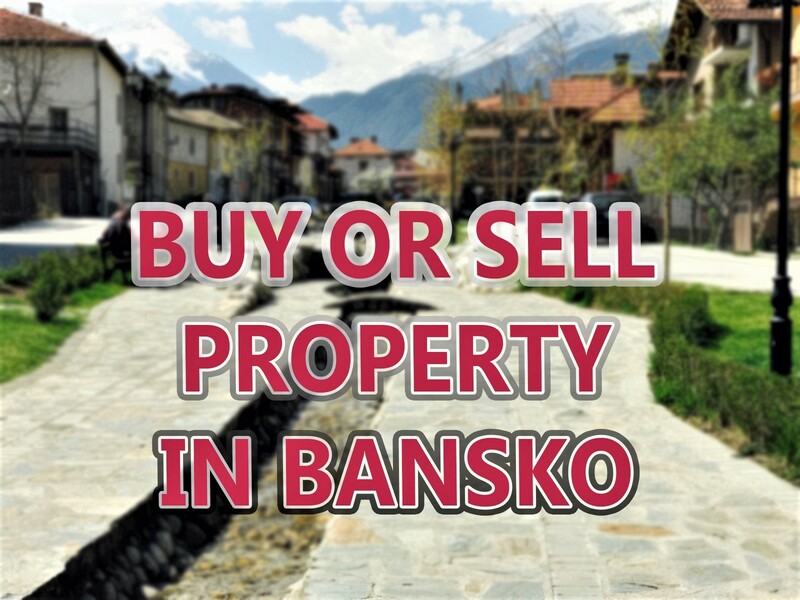 In Bansko, the word luxury is often used, but rarely deserved. I never recommend anything I do not like. For the Premier Luxury Mountain Resort, I experienced gastronomy, molecular cooking and service that is amongst the very best in Bansko. If I was pushed to make a criticism, it would be that the steak was cooked more like medium — rather than the rare I much prefer. The edible menu is true. It was a gimmick — but why not? It shows how little entertaining touches like this add up to make a gastronomic experience that will be remembered for a long time. If you have any comments on Gastronomy, the Premier Gastronomy Festival or any other related matter, then feel free to make them below.